Laurel High School senior Nicole Patille signs a letter of intent to attend Siena College in New York, where she’ll play softball. Shown with the Ocean View native, third from left, at last week’s press conference are, from left: front row, her brother, Dominic Patille; her mother, Christine Patille; and her father, Michael Patille; and, back row, LHS assistant principal Rhiannon O’Neal, principal Stephanie Smith, softball coach Jodi Green and athletic director Jerry Mears. Nicolle Patille of Ocean View transferred to Laurel High School last year and became a leader on its young softball team. 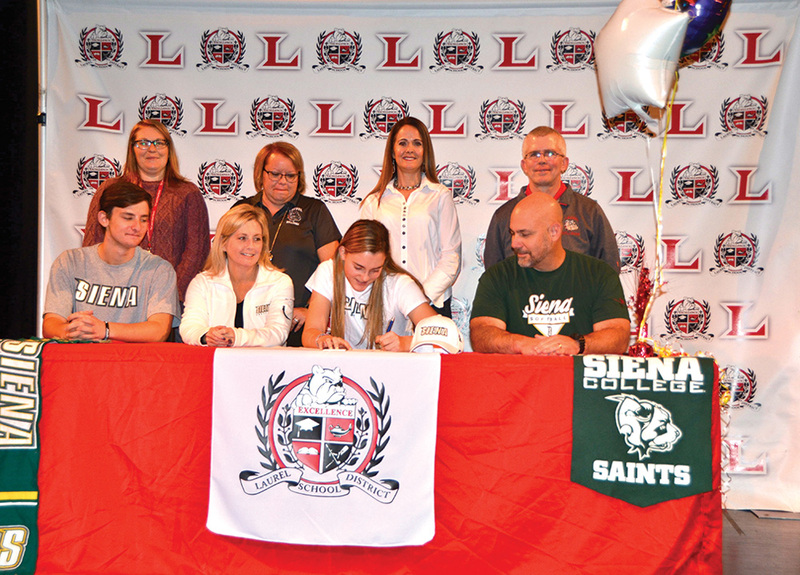 She enters the 2019 season as a senior, having already officially committed to attend Siena College in Loudonsville, N.Y., where she will continue to play softball. Laurel athletic director Jerry Mears said Patille blended in with the Laurel softball team and became an instant leader as the team’s pitcher. She becomes the first Laurel player to sign with a Division I school since Regan Green signed with Mississippi State in 2015 (before transferring to Baylor in 2018). “It’s been great to be a Bulldog. The environment’s very welcoming,” the Ocean View native said. She was joined at last Tuesday’s press conference at Laurel High by her parents, Michael and Christine Patille, and her brother, Dominic. Also in attendance were Mears, Laurel High principal Stephanie Smith, assistant principal Rhiannon O’Neal, travel-ball coach Brian Kalesse and pitching coach Les Riggleman. Laurel varsity softball coach Jodi Green, who takes the helm again after leading the Bulldogs to a pair of state championships in the past, received a call from Patille and her family three years ago, looking for advice on travel-ball coaches. Now she is coaching the senior hurler. “You’ve heard that it take a village. To raise a Division I athlete it takes a village and a half,” said Green, mother of Laurel alums Regan and Logan Green. Patille said playing travel ball for Kalesse helped her improve her game. “You see better competition, and you’re in the most competitive environment, other than college,” Patille said. She was raised to get her school work done before playing sports and is in the top 10 in her class academically. “That’s the way it is with college — you always have to keep your grades up to play in college,” she added.